This is a digital narrative that traces the life of Captain Antonio DaCosta, a Black Portuguese sailor who visited Japan in 1597. Starting with his early life as a slave in Lisbon, to his journey to the port of Nagasaki Japan, this site weaves together the story of his adventure. As a layered interactive experience, this site allows you to explore his personal diary, his drawings, and related artwork and historical notes from around 1500-1700, the Age of Exploration. 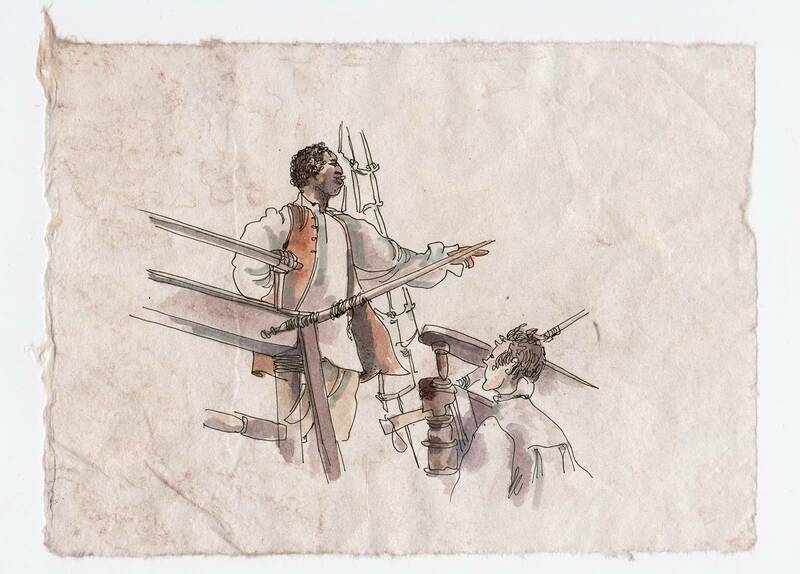 Rare for the 1600s, Captain DaCosta was a talented artist, writer, and sailor. With a keen eye for detail, DaCosta documented the cultures and people he encountered during his voyage. Throughout his diary, he longs for a place to call home, hoping to find it in Nagasaki. I’ve been working on this digital narrative for over four years. The inspiration first came from seeing Namban art, the paintings and art done by Japanese artists during the first cultural and economic exchanges with Europe. I was fascinated with the stories of the first foreigners to reach the shores of Japan, and what they must have experienced. The Age of Exploration was a time of great change. Africans, Asians, Europeans, and Americans were all exploring, vying for influence, and forging complex global trade links. Yet in all the history and documentation of this time period, I found it difficult to discover stories of the African experience, to hear about the changing world from someone who looked like me. Seeing the Namban screens the Kano School did of the Portuguese ships landing in Nagasaki, the numerous black and brown sailors at work on the ships and on the docks, I realized I needed to tell their story. I needed a way to understand what it meant to travel across the world, enslaved or free, in their own words. as people with complex narratives independent from that of the white Portuguese and historians. Captain DaCosta is based on extensive research into the economy, trade routes, culture, and people of the time period. It was my goal to create an authentic voice of that age, a voice speaking to us about exploration, loss, and belonging, from 500 misty years ago. Like so much of our documented history, the stories of women, people of color, and the underclass are systematically erased. It is almost a certainty that skilled Africans like Captain DaCosta traveled to and prospered in Japan, but their stories have been lost to history. A number of other stories tell the experiences of Black men in the Momoyama and Edo period Japan, but as far as I know, this is the first to tell the story of how one arrived there. The digital experience has three main facets– DaCosta’s written diary, his sketches, and art of the time period. My advice is to start at the beginning of the diary, exploring the associated images and galleries more information as you read. The related art, read historical details, or artifacts found alongside his written diary will help you understand a little more of what DaCosta’s world was really like.